Many of my projects are confidential. Therefor I am only able to show some of the projects I have contributed to in recent years. In a personal conversation I am able to tell you more about my approach in further projects. I helped a Finnish startup to pilot and test their health app on the German market. With an expert review and user tests I was able to deliver manifold recommendations for further optimizing its user experience and strategies for entering the German market. With these insights, the startup is enabled to improve their service and to bypass bottlenecks when launching in Germany. 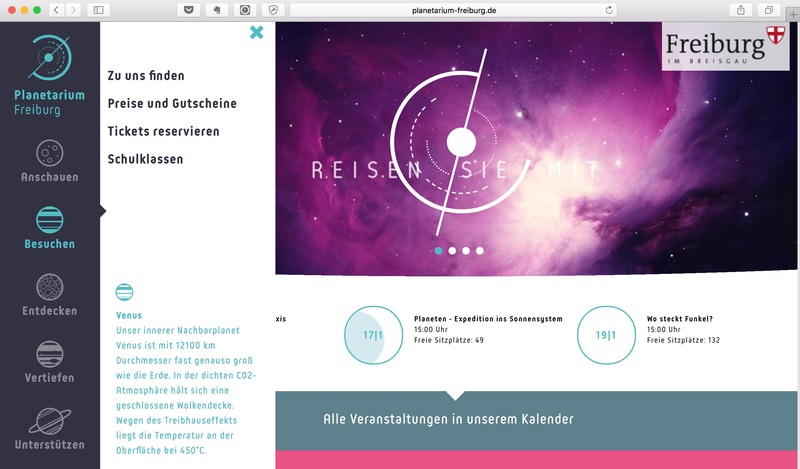 Together with the design studio know idea, I revised the website of the Planetarium Freiburg conceptually after a service test. Its new navigation supports even greater utilization of their shows. The improved delivery of information shapes visitors' expectations for an even higher satisfaction and presents opportunities to keep learning. For MAK3it I was one of 12 mentors in the first run of incubator program Rhevo between April and June 2017. For 12 weeks I coached four international teams (in)validating their business ideas. And my engagement was with significant success: No fewer than three of my teams were invited to the final pitch and will receive further funding. Together with colleagues I accompanied the transformation process of the University Library in Freiburg. With a fresh view from the outside, we restructured the navigation of their website from scratch and harmonized their contents. Applying Service Design methods, the library increased their cross-functional thinking for the benefit of their users. In order to focus even more strongly on the interests of citizens, the Pirate Party Saarland Parliamentary Group engaged in a 2-day Design Thinking Workshop during their yearly retreat. 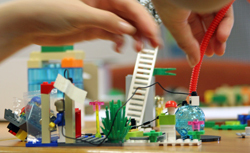 Guided by Daniel Bartel and myself, the four members of parliament and their staff tested Design Thinking and developed a shared vision using LEGO® SERIOUS PLAY®. The French division of Knauf, a family-owned enterprise in building materials and construction systems has been at the forefront in linking their marketing efforts into a true multichannel strategy comprising print publications, websites, desktop and mobile applications along with traditional marketing. Daily routines of their clients are facilitated by the suite of applications conceptualized and developed by BGA. As wrap-up and for a deeper immersion into the topics shown in their exhibition the Science House commissioned an exhibit portal. In a team of five students we conceptualized and developed a learning portal with administration functionality based on JavaEE, Spring and Hibernate over the course of two semesters at Hochschule Furtwangen University. Interaction design for an user interface of a new digital product for educational publisher Klett together with know idea GmbH. Participation in a Design Thinking project for a pharmaceutical company in Basle. Analytics tool assessment for an e-commerce provider.